As a natural gas producer, processor, gatherer or transporter, one of your highest business priorities is to deliver gas to market as quickly as possible. 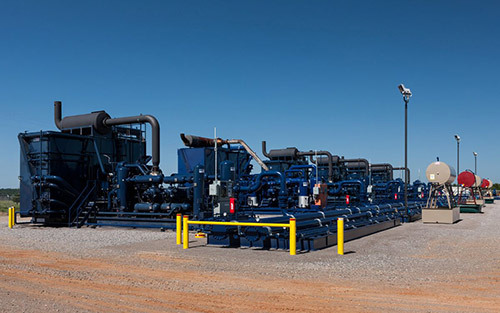 Through our Station Services offering, USA Compression deploys a complete compressor station that meets all your unique technical and operating requirements. Our pre-engineering and design philosophy is centered on skidded components, which offer speed and flexibility in meeting your needs. We also provide customized engineering options, to address unique technical and market challenges. Customers can count on USA Compression’s dedicated field service teams to provide exceptional 24/7 service. These experienced technicians provide full maintenance, inspection, evaluation and operating services, enabling our customers to maximize their volumes and reduce operating costs. Through our Station Services offering, we serve as your single source for operational and maintenance requirements. We take pride in being responsive to our customers’ requirements with their budgets and contracts. We deploy our equipment to render our services on a monthly fee basis, which enables customers to deploy their capital on their core businesses. At USA Compression, you will find a team that is easy to work with and aligned with your priorities. Through our Station Services offering, USA Compression handles every piece of equipment for a modular facility, including slug catcher, compressors, pipe racks, tanks, dehydration, valves and control room. We serve as the single source for all equipment for the facility – allowing your employees to focus on their critical tasks. USA Compression maintains strong working relationships with our vendors, enabling us to offer a comprehensive range of components and customized equipment packages. With our inventory, our team is ready to quickly deploy the facility and meet your goal of moving gas to market with speed and reliability. We are committed to creating a safe and environmentally-responsible workplace wherever our employees work. We serve as a safety partner to our customers and take a proactive approach to maintaining a safe work site at our facilities located on a customer’s site. USA has developed a proprietary software application R3, Right Tech, Right Tool, Right Part – First Time Every Time, to minimize customer impacted volumes by identifying the closest qualified technician, part and tool to ensure units are returned to service faster and more efficiently than any other compression service provider in the industry! With our Station Services offering, you can move your gas production to market up to eight weeks quicker than conventional construction. With our pre-engineered and modular contract compression station, we focus on reducing installation and start-up time as well as minimizing the facility’s footprint, which provides significant cost efficiencies during de-mobilization and site remediation. Our services are specifically aimed at serving gas producers, processors, gatherers and transporters in all the emerging and prolific shale plays in the United States.